Everyone's favourite sword-wielding and fruit-slashing app developed by Halfbrick is available in vibrant and colourful detail with the mind-blowing immersion of virtual reality that allows you to become a Fruit Ninja. Moving the app into a fully immersive virtual reality experience feels completely natural as you go from swiping your finger across a mobile screen to cut the fruit, to swinging your arm with a fully-tracked motion controller in a beautifully rendered 360 degree environment to slice fruit effortlessly in two with your samurai swords. With quite a few different game modes to try you really are spoiled for choice with Fruit Ninja. There is the fantastic arcade mode which gives you a full 60 seconds to slash, dice and cleave as much fruit as you can, while challenging you to avoid the random bombs that get thrown into the mix. Then there is classic mode which punishes you if you miss a single piece of fruit and only gives you a total of three lives. Lastly there is the Zen game-mode, in which you have to use your ninja-like reflexes to slice the fruit as it's shot at you from a cannon. 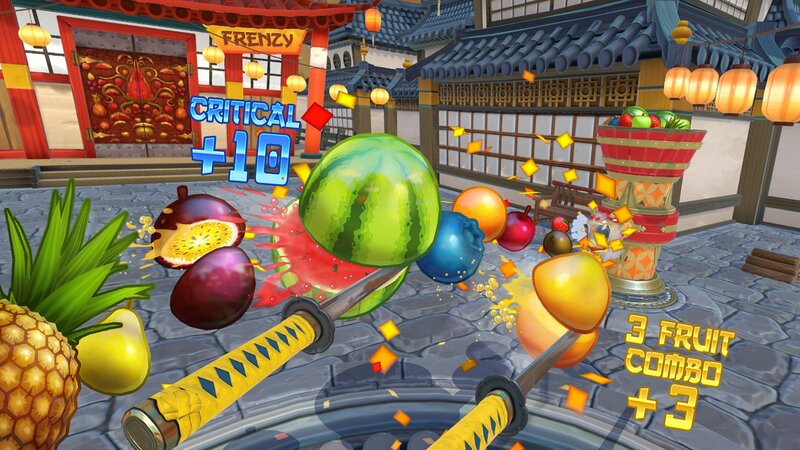 Fruit Ninja is a simple display of what virtual reality has to offer. With its perfect use of motion control and its beautiful design, Fruit Ninja is perfect for all the family.